Middle-England seemingly went into shock when it was announced that David Dimbleby, broadcaster and establishment figure par excellence had succumbed to having a tattoo. Although some time has now elapsed since Dimbleby’s tattoo made headline news, getting the tattoo whilst filming a documentary about ‘Britain and the Seas’ taps into something that time has not weakened. Tattoos have long been associated with rebellious sub-cultures, yet it is their association with sailors and maritime life, which provides a clue to their origins. Emerging from the underclass of seafaring society, tattooing has a long and colourful history and one that is inextricably linked to sailortown culture passing back and forth through the coastal borderland spaces of ports. 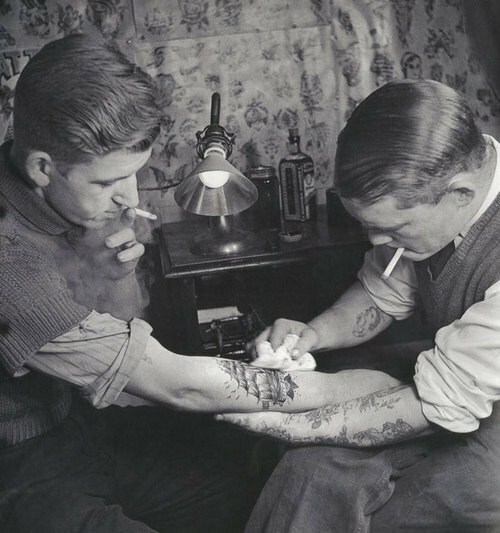 Like the modern day studio where Dimbleby had his tattoo inked, tattoo parlours were more often located in port areas, specifically in the so called sailortown districts. These sailortown areas frequently harboured society’s underworld with many of these ‘roughs’ adopting the sailor-esque tradition of inking their bodies, and the art of tattooing soon became a visual culture in its own right among all strata of society. More widely, tattooing in Western culture owes much to this sailor-tattoo relationship that fashioned a whole genre of nautical-themed tattoos created, conveying experiences for those around to read, even without a verbal exchange taking place and this was never more paramount than in sailortown areas of ports that sailors frequented. Indeed, when Samuel O’ Reilly, a famed New York tattoo artist, stated “a sailor without a tattoo is like a ship without grog: not seaworthy,” he reflected a widely held, trans-national idea that sailors and tattoos were natural counterparts, and that the mark of a sailor was quite literally displayed by the inked designs on their bodies. Interest in tattoos, their origins and history have been studied for many years but tattoos and sailors have a longer history. Born out of a blend of ‘exotic’ travel, superstition, collective custom and individual expression, tattoos were used by sailors to display, reveal and represent the many twists and turns of sailor-life. In Britain, a definitive link between tattoos and sailors can be traced to Captain Cook’s voyage to the South Pacific in the 1700s. Sailors from this voyage, having seen tattooed natives, embraced this art form and inked their bodies with symbols and designs that signified their journey to this foreign and exotic clime. From here, tattooing became a symbol closely associated with sailors, fashioning a subculture in nautical themed body art that has flourished over the past three centuries. Whether naval, merchant or fishing sailors, tattoos were used by seafarers to mark them out as distinctive in comparison to the so-called ‘landlubbers,’ when in port. They were also symbolic expressions linked to maritime superstitions and customs and denoted and signified jobs and experiences within seafaring life. For example, it was said that if the North Star was tattooed on a sailor’s body it would enable them to find their way home. Tattoos were also used to denote rank and experience, such as ropes around the wrists to represent a deck hand, or the infamous ‘Hold Fast’ tattooed across the knuckles believed to give sailors a steady hand when climbing ropes, especially if one was a rigger. 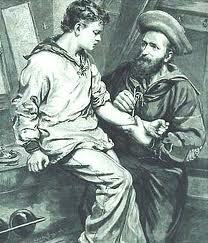 Similarly, the swallow tattoo indicated experienced sailors that were said to have sailed over 5,000 nautical miles. Others marked a significant event in seafaring life where upon it was customary to mark the event on one’s person. Such as, perhaps the most recognisable of all sailor tattoos, the customary anchor that marked the event of having sailed the Atlantic Ocean or a full rigged ship that denoted a sailor had sailed around the Cape Horn. 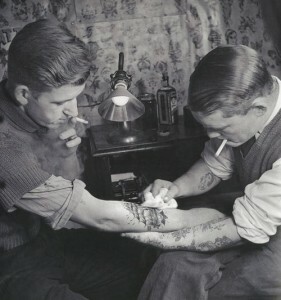 A scene from Tattoo Jack’s shop in Denmark, circa 1942, from Jon Norstrøm, Danish Tattooing, (Denmark: Gingko Press Inc, 2013). Many sailors inked words and symbols on their bodies that held individual meaning and tattoos, such as the ‘Homeward Bound’ writing or the iconic ‘Mum’ design, enabling sailors to maintain a permanent, symbolic bond to home. Whilst the above is far from a comprehensive history of tattoos, tars and sailortown culture, it shows that the powerful and distinct link between maritime culture and the tattoo still endures today. After all, the history of the sea and sailors was the very thing that Dimbleby was seeking to discover when he decided to have his now infamous tattoo. Marcia Texler Segal ed. Interactions and Intersections of Gendered Bodies at Work, at Home and at Play, (Bingley, Emerald Group Publishing, 2010), see “Introduction.” See also, Chris Bobel and Samantha Kwan, eds., Embodied Resistance: Challenging the Norms, Breaking the Rules, (Tennessee, Vanderbilt University Press, 2011), Michael Atkinson, Tattooed: The Sociogenesis of a Body Art, (Toronto: University of Toronto Press, 2003). Marcus Rediker, Between the Devil and The Deep Blue Sea: Merchant Seaman, Pirates and Anglo-American Maritime World, 1700 – 1750, (Cambridge: Cambridge University Press, 1989), 11 – 12, Les Black, “Inscriptions of Love,” in Helen Thomas and Jamilah Ahmed eds., Cultural Bodies: Ethnography and Theory, (Oxford: Blackwell, 2004), 28-29 and Samuel M. Steward, Bad Boys and Tough Tattoos: A Social History of the Tattoo with Gangs, Sailors and Street-Corner Punks, (Binghamton: The Haworth Press, 1990), See Introduction. Ray Broadus Brown and Pat Browne, eds., The Guide to United States Popular Culture, (Wisconsin: The University of Wisconsin Press, 2001), 806. See also, Carol Clerk, Vintage Tattoos: The Book of Old-School Skin Art, (USA: Universe, 2009) and Jonathan Eyers, Don’t Shoot the Albatross! : Nautical Myths and Superstitions, (London: A & C Black Publishers, 2011), 31 – 32. DeMello, Encyclopaedia, 188, Levy, Tattoos in Modern Society, 22 -25, A.D. Couper, Sailors and Traders: A Maritime History of the Pacific Peoples, (Hawaii, University of Hawaii Press, 2009), 20 – 21. Malcolm Archibald, Sixpence for the Wind: A Knot of Nautical Folklore, ( Caithness: Whittles Publishing, 1998), 12 – 13. Chet Beates, Son of a Gun: The Life and Times of a Lifer Brat, ( USA: Lulu.com, 2007), 128 -129. Beates, Son of a Gun, 128 -129, DeMello, Encyclopaedia, 65. See also, Isaac Land, War, Nationalism and the British Sailor, 1750 – 1850, (Basingstoke: Palgrave Macmillan, 16 and Black, “Inscriptions of Love,” 28 – 29. I was born in a small fishing town on the East coast. Growing up I noticed that a lot of male locals had either a shooting star or swallow tattoos. It was described to me that it was a local identity, soon as I was old enough I had the swallow tattoos on my shoulder blades. This article has got me really interested in my local history, it was a a Hanseatic town and was an important trade route during the 13th century, it would have been heavily influenced by Baltic sailors. Thanks for taking time to stop by and comment – glad you enjoyed the article and it has helped to spur your interest in your local history. Out of interest what small fishing town on the East coast are you from? I was born in King’s Lynn on the North Norfolk coast.